A 32-year-old man presented to the dentist to receive root canal therapy. During the treatment, a C+ file dropped and was accidentally swallowed by the patient. No foreign body was found by emergency gastroscopy that day. 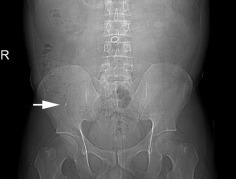 The next day, abdominal radiograph showed a cross-shaped high-density shadow in the lower right abdomen (Figure 1, arrow) and the shadow did not move obviously in the radiographic reexaminations during the following 3 days. The patient did not complain of any discomfort. 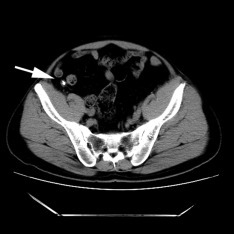 On the fifth day, computed tomography (CT) of the abdomen and pelvis indicated a hyperdense structure located in the ileocecal region. The hyperdense structure was confirmed by colonoscopy to be the C+ file, which had lodged in the appendix after the attempt to extract it with biopsy forceps failed. 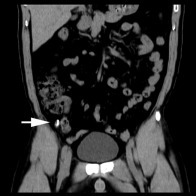 The patient underwent a peritoneoscopic appendectomy to remove the appendix, which was swelling and congestive with the C+ file obstructing the lumen of the middle part of the appendix. The patient had no postoperative complications.